"The Joshua Tree" is a rerecording of the U2 album of the same name. I bought the original album when I moved to Sweden from California in 1988 (at the age of fifteen), partly because it reminded me of my former home. It became a link back to a more familiar environment and culture. In 1998, ten years later, having started art school, I decided I wanted to work with that theme. I recorded my own versions of all the songs on the album on a four-track portable studio, playing all the instruments (acoustic guitar, bass and drums) myself, as well as singing. 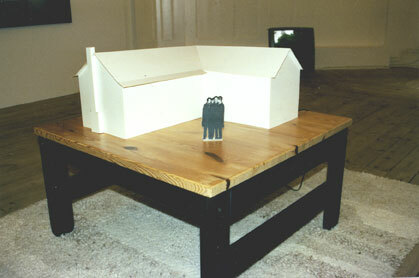 The work was presented as a cardboard model of my former home in California, out of which the music emanated. The house itself was standing on a low table, which in turn was placed on a grey rug. Both of these items of furniture had been brought along from California to Sweden. Outside the house was a cardboard cutout of a group of four persons, mimicing the band photo on the cover of U2's "The Joshua Tree" album. On closer inspection it can be seen that all four persons are the same, being, in fact, me.